This listing includes the original game CD. On-line help is available within the game. The box is pictured for reference and is not included. I will also provide a compatibility CD that will allow the game to run under ALL VERSIONS of Windows 10, 8, 7, Vista and XP, both 32 and 64 bit. NOTE that Internet play no longer functions. Puzzles in general seem to be aimed at a highly select group of people in the world. It takes a sharp mind and sometimes incredible amounts of patience to work out the intricacies of brain teasers, logic riddles, and the like. Puzzle video games on the other hand can be an attractive diversion for many different kinds of individuals. One usually only needs such elements as fast reflexes, some intuition, lots of caffeine, and maybe a little luck. Lucas Learning's Pit Droids draws some of its appeal from these well-known traits, but mixes in some of its own nuances to make it just that much more worthwhile. Starting out, players will be shown the rudimentary plot of the game via the time-honored Star Wars intro screens. It seems that Watto (the Toydarian junk trader from Episode One fame) has purchased a fresh "shipload" of pit droids and needs you to help him get them to the pod racing arena. 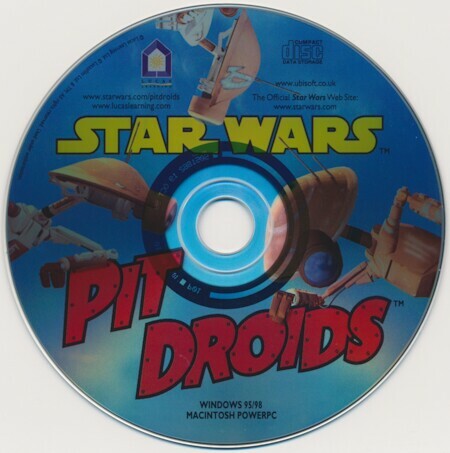 For those who are scratching their heads already, pit droids are small repair robots used during pod races in the same way that pit crews are used in the Nascar races of the real world. Unfortunately, our helpful little metal heads are a couple sandwiches short of a picnic. Apparently, the extent of the programming for these mechanical wonders didn't reach beyond the repair of pod racers. Such small lessons as "how to avoid spinning fans of death" and "not walking into each other and collapsing on the floor" were not included in the master plans. Thus, it falls to you to guide these mischievous mongrels through over 300 brain-baking puzzles while keeping as many of them intact as possible. Good luck. To assist first time players, an informative tutorial is accessible should you desire to view it (I recommend doing so), and is even hosted by none other than everyone's favorite protocol droid, C-3PO. Essentially, each level begins with 48 droids in your launching bays. They are expelled one at a time onto the 3-D playfield, and it is your job to guide them to the goal. Left unattended, the robots will happily beeline on a direct path to whatever lies before them, be that a brick wall, pile of junk, or the aforementioned whirling blades of death. To navigate these contraptions, an inventory of arrow tiles is at your disposal. 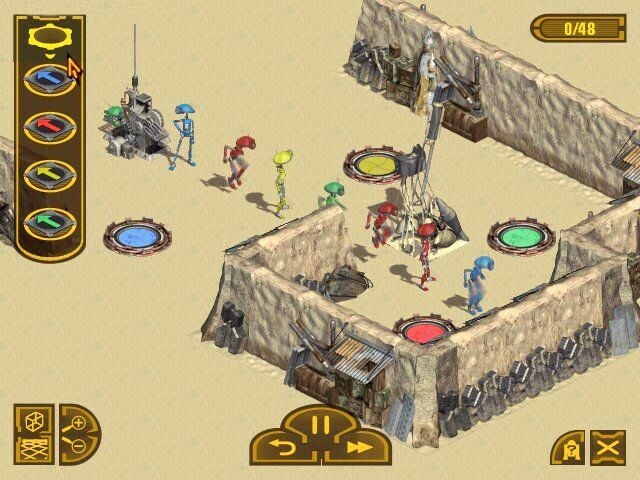 Placing an arrow on the playfield, in the path of the droids, will cause those droids passing over the arrow to alter their direction. On the most basic of scales, levels are essentially completed by using these arrow tiles to guide these fellas around dangerous or impeding objects and into the final goal tile. However, this simplistic style of gameplay doesn't last long. Pretty soon the droids start gaining different color skins, and begin to carry varying tools. The arrows, dangers, barriers, and even goals start to only apply to droids with certain attributes. Thus, it becomes necessary to redirect some groups of robots to other areas of the map, either to avoid dangers which only affect them, or to access paths that only they can utilize. Ultimately, the goal is always to allow all 48 droids to reach the final tile. However, as one might imagine, it gets progressively more difficult to save them all. The three difficulty levels of the game compensate for this, affording you with varying numbers of total droids available. On the easiest difficulty, there is an infinite supply of the drones awaiting their call to duty in the transport ship. However, the hardest difficulty is far more limited, ringing in at a total of 240 units. Each of the nine different puzzle areas must be played over and over again (with different puzzles on each attempt) until a total of 144 robots have reached the exit. Once that has been accomplished, a small "reward movie" is displayed (usually depicting the foolish antics of the absent-minded drones), and then the next puzzle area is made available. If you're good, you'll be able to get out of each area after completing only three puzzles. However, if you lose a few tin cans along the way, you'll have to bring in some reinforcements from the transport. Unlike some other mind-benders out there, Pit Droids doesn't seem to bank as much on lightning reflexes as the rest of the pack. The game utilizes a pause feature, and is nigh impossible to complete without making good use of it. 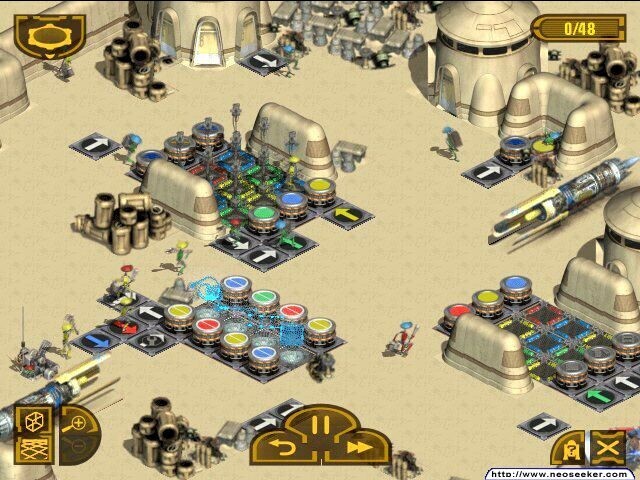 In fact, the game can be configured to begin each level in a paused state, allowing players to get a good grasp of exactly what arrows they have available to them, and how they may have to use them to get their droids to the exit. This type of play experience may appeal to those gamers out there who just couldn't take the later levels of Tetris or Puzzle Fighter, or for those who simply found those games un-enjoyable due to the necessity of having fast fingers and a faster mind. Even the title's manual emphasizes the fact that the entire point of the game is to let players use and develop problem solving and analytical skills in a non-stressful environment. This isn't exactly the pinnacle of excitement, but some things are forgivable. To further add to this title, Lucas Learning has also incorporated a puzzle creator. Once players have mastered all the game has to offer (and that should take some time), they can take to their designing whims and put together a few stumpers of their own. If you construct a real gem, you can even upload it to the Pit Droids' dedicated website. Gamers are free to exchange their creations with those of others across the nation, potentially adding months or even years to the life span of the experience. For players who want to shift away from the extreme pace that exists in other puzzlers, this one might be just what the doctor ordered.